Bob Mounts introduced the dignitaries in attendance. The minutes of the 2017 Annual Meeting were approved as written. Frank Green, Treasurer, presented his report, which was also approved as written. The ending balance of the checking account was $721.57 and of the savings account was $13,611.86. Diane Hurtak, a recently retired accountant and Bursar for the University of Florida, reported that she had reviewed the bank statements, general ledger, and Treasurer’s report for the past fiscal year. All three agree and appear to be in order. Bob Mounts presented the 2017-2018 President’s report. He noted that UPNA sponsored a City Commission Candidates’ Forum in the Spring, as well as the popular Spring Picnic. He thanked the outgoing officers and directors for their service. Bob advised the members present that outgoing Directors and founding members Mark Goldstein and Mary Ann Mehn were applauded for their service at the October meeting of the Board. Each was presented with a commemorative crystal paperweight. Bob Mounts discussed the major issues faced by the UPNA neighborhoods during the past year, and the challenges the neighborhoods face in the coming year. Lynne Holt, Chair of the Nominating Committee, announced the nominations for the following year. The slate was unanimously approved, and elected. Officers: Richard (Rich) Doty, President; Don Peters, Vice President; Frank Green, Treasurer; and Kit Macdonald, Recording Secretary. Directors: Peggy Carr, Bob Cohen, Arnall Downs, Crystal Goodison, Anne Haisley, Brian Marchman, Virginia Maurer, Robert (Bob) T. Mounts, Dave Nicholson, Tucker Ryals, Sally Warrick, Dave Wilson, and Lucien Wegner. Newly elected President Rich Doty thanked Bob Mounts for his years of service as President, and presented him an engraved crystal paperweight as a memento. Rich discussed plans for 2019-2020, including increased communication with the membership, additional outreach to the neighborhood, and continued advocacy for UPNA and its members. 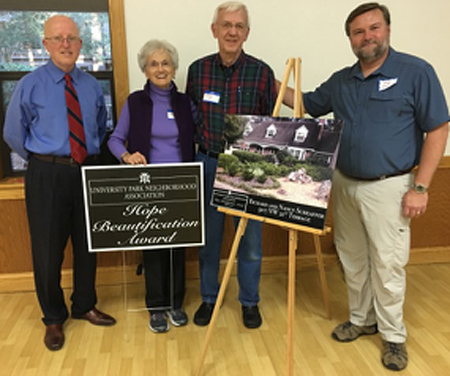 UPNA Hope Beautification Awards are given to honor those who improve our neighborhood through the renovation, improvement, or ongoing maintenance of their yards, gardens, and homes. 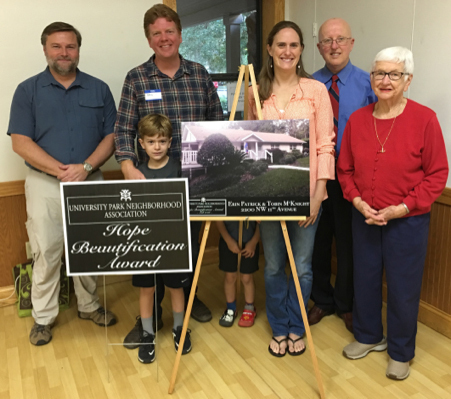 Edwina Hope, widow of Don Hope, for whom the Hope Beautification Award is named, was introduced, and Rich announced the recipients of this Fall’s Awards: Erin Patrick & Tobin McKnight of 2200 N.W. 11th Avenue, and Richard & Nancy Scheaffer of 907 N.W. 21st Terrace. Stephanie Marchman, an attorney and a member of The Florida Bar Board of Governors, discussed the Florida Constitution and this year’s proposed amendments to it, which appear on the November 6th ballot. 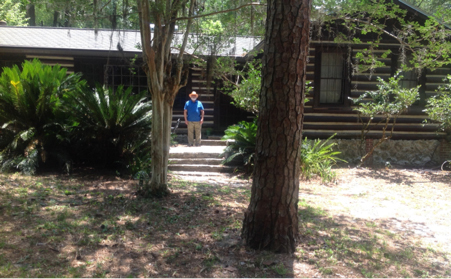 Arnall Downs briefly discussed the recent recognition of The Carlos & Marjorie Proctor Log House and Cottage (now owned by Ms. Downs and Professor David Ostroff) by the National Register of Historic Places. 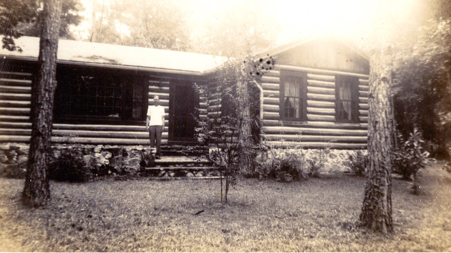 She presented photographs of the property taken during construction around 1938-1940, floor plans of the buildings, and recent photographs of the house and property. Murray Laurie, a well-known local historiographer, gave an informative presentation of the processes for National Register of Historic Places recognition and for establishing Historic Overlay Districts. The meeting was adjourned about 5:30 pm, and was followed by a lively potluck dinner.